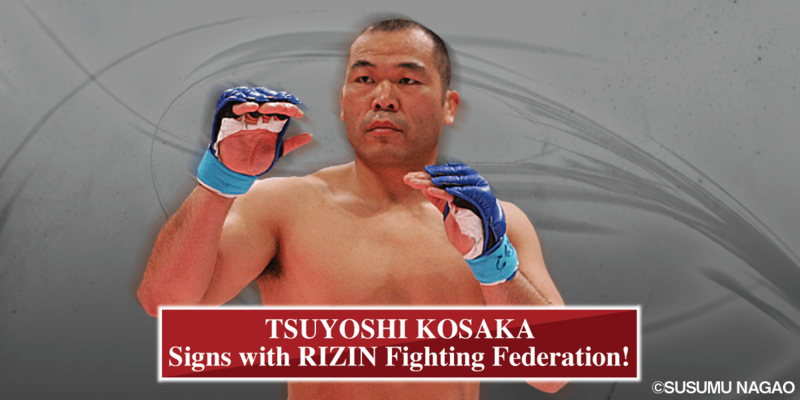 Tsuyoshi Kosaka will participate in RIZIN FIGHTING WORLD GRAND-PRIX 2015 SAITAMA 3DAYS held at the Saitama Super Arena on December 29th (Tue) and 31st (Thu) of 2015. He is returning back into the ring nine years after he announced his retirement followed by his loss against Mark Hunt in May, 2006. Kosaka was born in 1970, and is 45 years old. This is a proud age for a cage fighter. He entered the path of a MMA-Warrior in ’93, and from ’98 he became the first Japanese fighter who fought in the UFC regularly, known as “TK”. He has fought numerous opponents across the world during his MMA-fighter days, including his TKO victory against “The last emperor” Fedor Emelianenko. After his retirement he has kept busy training the young generation, and commentating on several MMA events. Kosaka has been training every day even after his retirement and claims that he is in “the best condition of my life”. Being prepared mentally and physically, Tsuyoshi Kosaka is 100% ready to make his comeback. His presents at Rizin FF is a great addition for that event.